Mr. Jonathan Shield is a veteran in the Church of Christ and has spent the best part of his life in the service of Primitive Methodism. He has loyally served his Church and is now enjoying a well-earned rest. Born in West Allendale, Northumberland, in 1840, thirty-two years ago he removed to Nenthead, in the Alston Circuit, where he now resides. He joined the Nentsbury Church, which is in close proximity to his home, and is still a member and Class Leader. Beginning work at ten years of age, he had few opportunities for education, and what knowledge he gained was at a week evening school. For some years he has been a Sunday school teacher, and a local preacher for forty-six years. He speaks with pleasure of the fact that the President-elect (Rev. 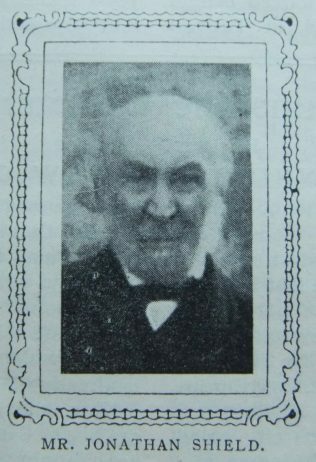 J. Ritson) started his preaching career along with himself and accompanied him to his appointments. In this capacity he has travelled long journeys reaching to a distance of sixteen and eighteen miles. He was in great demand for services in neighbouring Circuits in Weardale, Teesdale, Allendale and elsewhere. He has been a Class Leader for fifty years and in this sphere has done a praiseworthy work, being able because of his rich experience, high tone of spiritual life, and having a mind well stored with Scripture teaching, to give advice of a timely and helpful character. Many that have been associated with him, speak with grateful hearts of the help they have received from his wise counsel and appropriate instruction. As a Class Leader he has been painstaking, punctual, and delighted to minister to the needs of those committed to his care. Jonathan was born in 1840 to parents Thomas and Barbara. Thomas was a lead miner. Jonathan worked as a lead miner. Jonathan married Dinah Rodham (abt 1838-1897) in the spring of 1866 in the Hexham Registration District, Northumberland. Census returns identify five children. Jonathan died in early 1917 at Nenthead, Cumberland.